At a typical coal –fired power plant, the coal from the mine is typically delivered to the plant in large trucks or via rail, and dumped into the run of mine (ROM) hopper. Once at the plant, it is fed through a primary crusher and conveyed to a coal storage building. The coal storage building is used to” blend”coal from different places of the mine to make it more consistent for burning. The coal handling system is a facility, which washes the mined coal blocks and crushes them into graded coal chunks. Our coal handling system is very efficient in the removal of waste and dust, to ensure greater market value of coal. The offered coal handling systems process the coal in multiple stages such as coal sampling, coal washing, crushing, screening, gravity separation and de-watering. From the coal storage building, the coal is crushed again and conveyed to smaller coal storage bunkers in the power plant. From there. The coal is fed to the pulverizes which grind it to the fine powder which is burnet in the boiler. Designed at our end under the guidance of experienced engineers, these Coal Handling Plants are ensured for their consistent functioning and that too for a longer period of time. All the basic equipment like crushers, screens and feeders etc are manufactured by us in house, resulting in assurance of best performance of complete Coal Handling Plant. We are a reliable Manufacturer, Exporter and Supplier of Coal Handling Plant in India. We also provides complete civil and structural work for the entire CHP including Ground hoppers, wagon tippler hopper or track hopper and tunnels, crusher house, transfer towers and complete structural supports. 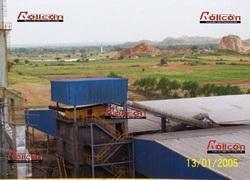 Rollcon has full range of belt conveyors, bucket elevators , vibrating screens, gates and diverters , screw conveyors , ash conveying systems , magnets , switches , chain conveyors , crushers , weighing , spares , roll crushers, ring granulators or impact crusher etc depending upon application and requirement of the coal handling system.